Preheat oven to 350F degrees. Line two large cookie sheet with parchment paper or a silicone baking mat. Divide all Oreos, and remove the centers. Place the cookies in a food processor, and crush until fine crumbs remain. Set aside 1/2 cup of the crumbs. Add in the softened cream cheese, and blend in food processor until the cream cheese is fully incorporated. Shape into 3/4 inch balls, and refrigerate. In a large bowl using a hand-held mixer or stand mixer fitted with paddle attachment, beat the butter for about 1 minute on medium speed until smooth and creamy. Add the brown sugar, and beat on medium speed until creamy. Mix in egg, egg yolk, and vanilla on medium-high speed until combined. Scrape down the sides and bottom of the bowl as needed. In a separate bowl, combine flour, cornstarch, baking soda and salt. On low speed, slowly mix the dry ingredients into the wet ingredients, until combined. The cookie dough will be pretty thick. Add the white and semi-sweet chocolate chips, and the reserved 1/2 cup of Oreo crumbs. Mix on a low speed for about 5 seconds, until evenly disbursed. 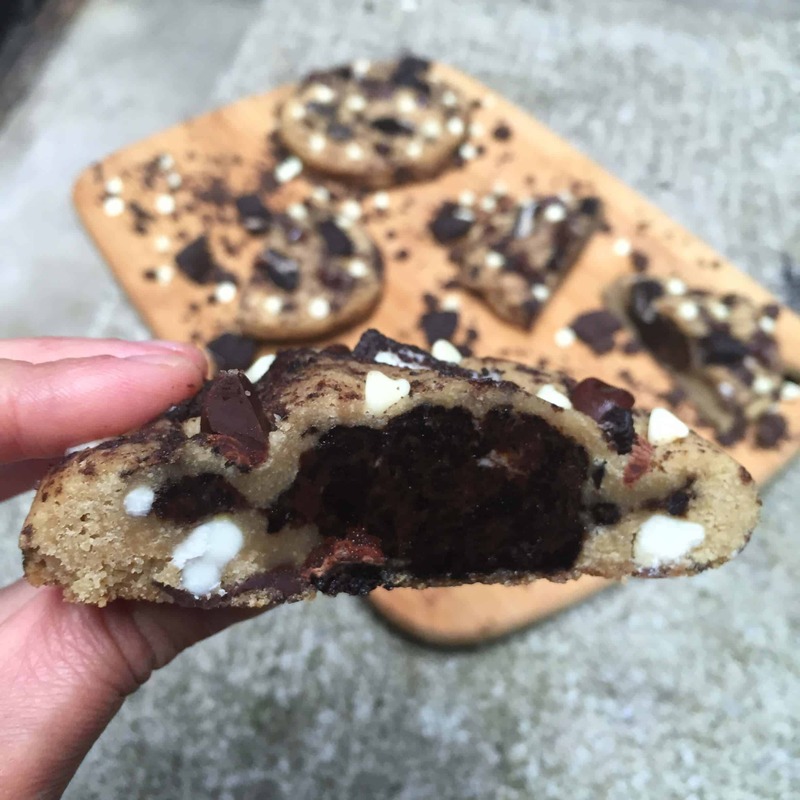 Using a cookie scoop, make 1.5 inch cookie dough balls. 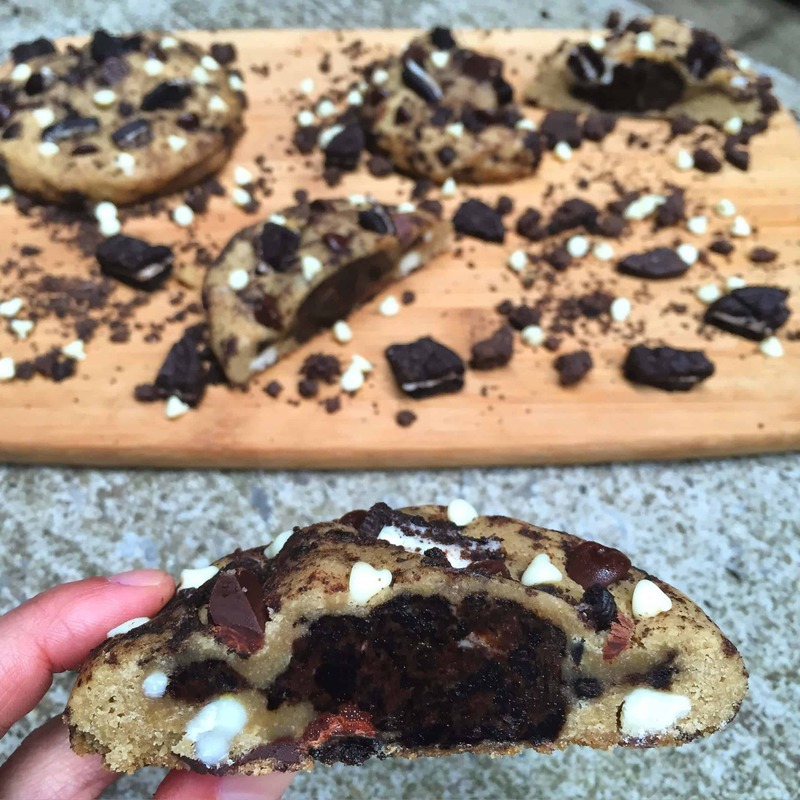 Flatten the cookie dough in you palm, and place the cold oreo truffles in the center of the flattened cookie. Shape the cookie around the truffle, making sure it is fully sealed. Place 2 inches apart on lined baking sheet, and bake for 9-11 minutes, or until the edges just begin to brown. Let the cookies cool on the pan for 10 minutes, then remove and place on a wire rack to finish cooling. These cookies freeze well, and last several days if stored in an air tight container. The cookie will continue to bake once it’s removed from the oven, and will firm up as it cools. I prefer my cookies on the soft side, and took them out of the oven at the first hint of brown on the edges of the cookie (9 minutes).